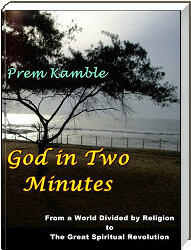 Mentomatics is a term coined by me and is used in my e-book "God in Two Minutes" available at Amazon. Mentomatics is derived from the word Mathematics. Man has mastered the world around him. He has explained the laws governing the physical world and the physical forces. What made all this possible was his knowledge of science. More specifically, it was the language of mathematics which helped him to document the laws governing the universe and to reproduce their effects with precision. With science and mathematics, man has explored and to a large extent explained the world around him. He has reached distant planets in our universe and now gone beyond our universe. However, there is one area which is very close to him which is completely in the dark. Whereas he has understood the world outside, he is yet to understand the world within him, the world inside his mind. He is completely in the dark as to what is the Mind, why does a person have highs and lows, what makes a man successful or happy, etc. Whereas we have mastered the laws governing the physical space outside, the laws governing our mind and the space within are still a mystery. Before Mathematics was developed, all physical phenomena like rain, wind, sunrise, etc. were explained in terms of god. Similarly, what is unknown today - the human mind and why a man is happy or successful - are explained in terms of god. So we say that God makes a man happy and successful. Everything unexplained is easily explained using god. Before the advent of Mathematics, no one could have imagined what we know of Mathematics today. No one could have imagined the earth was round and floating in space, that we are all living on a round earth without falling off into hell! No one would have imagined that all this would be logically explained with Mathematics. Similarly, today we cannot imagine that all the unexplained phenomena of the mind and human behaviour will one day be explained with a new science which I call Mentomatics. Just as Mathematics gave birth to Physical science and ushered in the Industrial and Information revolutions, Mentomatics will usher in the next big revolution - the Spiritual revolution. The laws of Spiritual world will be explained. "What is Mentomatics?" you will ask. Mentomatics is as unexplainable and as unimaginable today as Mathematics was before it was developed. Go back in time to an era when Mathematics and Physics were not developed. Imagine yourself to be in that era and ask the question "What is Mathematics?" to a person of the pre-mathematics era. What answer can you expect? All of us of the pre-Mentomatics era will have the same problem answering the question, "What is Mentomatics?". It is a concept in its infancy, or rather not even born yet. Mentomatics can be explained only with an analogy of Mathematics - Mentomatics is a science or language that will explain the currently unexplained part of human mind, the dark area of the world inside man's body and mind, just as mathematics explained the physical world outside. Mentomatics will be for Mind Science what Mathematics is for Material/Physical Science. Just as mathematics helps to explain the laws of physical space, mentomatics is a field of study (yet to be developed) which will explain the laws of the mental space - or in other words, the spiritual and mental phenomena. Just as we define x, y, z as the three coordinates of the physical space (and time the 4th dimension), maybe we will discover the coordinates of the mental space inside. Just as mathematics explained the laws within the 4 dimensional physical space, mentomatics will explain the dynamics of the mental space. "When will Mentomatics be developed?" We do not know. It may take years or thousands of years, or it can be discovered tomorrow. Before mathematics and physics, all physical phenomena like rain, lunar eclipse, wind, sunrise etc were explained in terms of god. Mathematics came in and explained the phenomena scientifically, and god had to make an ignominious exit. Today, similarly the unknown realm of the mind is explained as a directive of god. Just as Mathematics helped explain the laws of physical science, the new language called Mentomatics will explain the laws of mental and spiritual world. The concept of God and religion will then be "mentomatically" explained. We will be able to reach God in two minutes. To know more, click here to download and read the e-book right now! Summary of the ebook "God in Two Minutes"
Article: "Is God a Myth?"